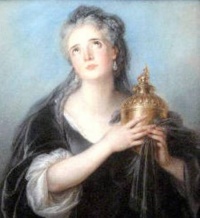 Adrienne Lecouvreur as Cornelia is a painting by Charles-Antoine Coypel depicting the actress Adrienne Lecouvreur (1692 – 1730) as Cornelia Metella in Pierre Corneille’s “The Death of Pompey” (1642). The painting was later engraved by Pierre Imbert Drevet. Unless indicated otherwise, the text in this article is either based on Wikipedia article "Adrienne Lecouvreur as Cornelia" or another language Wikipedia page thereof used under the terms of the GNU Free Documentation License; or on original research by Jahsonic and friends. See Art and Popular Culture's copyright notice. This page was last modified 07:01, 29 March 2014. This page has been accessed 1,208 times.